and a legendary concert is still remembered. TOMORROW is the 60th anniversary of one of the most shameful episodes in the history of Soviet so-called socialism, the "Night of the Murdered Poets", on August 12, 1952, when thirteen prominent Russian Jews were executed after a mockery of a trial behind closed doors, and using confessions extracted by beatings and torture. Not all were poets, but all had been involved in the Jewish Anti-Fascists Committee set up to mobilise solidarity with the Soviet Union in the war against Nazi Germany. The idea for this had originally come from two leaders of the Jewish socialist Bund in Poland, Henryk Ehrlich and Victor Alter, who had been captured and imprisoned in the USSR, then released after the Nazis invaded, only to be jailed again and executed as "Nazi spies". It is possible the Stalinist authorities were concerned that the two had sought the truth about the Katyn forest massacre or that they had been in touch with left-wing dissidents still imprisoned. News of the killing of the two Bundists had caused international outcry, but the Soviet regime may have hoped this would be forgotten with the needs of the war, and by sending a high-profile Jewish delegation abroad to win support. It was during a Jewish Anti-Fascist Committee event chaired by Albert Einstein in New York on July 8, 1943 that the singer Paul Robeson and his wife Eslanda met two of the Soviet visitors, playwright Shlomo Mikhoels and poet Itzik Feffer, at that time a colonel in the Red Army to which he was atached as a war correspondent. After the war, the very international links which had been an asset of the Soviet Union began to be seen as suspect. The country had entered a nationalist phase which affected all aspects of culture. Whereas Lenin had spoken highly of the internationalist aspect of Jewish contributions to the movement, a campaign began in 1949 against "rootless cosmopolitans". Although Stalin and the Stalinist parties -even, to their cost, those in the Middle East - had supported the creation of the State of Israel, it is said the Kremlin was rattled by the enthusiasm shown by Soviet Jews. However, Shlomo Mikhoels had been murdered months before this, in what was contrived to look like a car crash, but was arranged on orders from the highest level. Itzik Feffer was then arrested and followed by others, though it would take time work out why they were being held, build up a case against them, and extract as many concessions as could be. Meanwhile all the outside world knew were rumours. 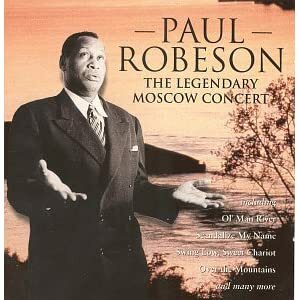 So it must have caused some consternation to the authorities when Paul Robeson, not just an internationally reknowned singer, but a communist and unquestionable friend of the Soviet Union, arrived in Moscow in June 1949, as a star guest for celebrations of the 150th anniversary celebration of the birth of Russian poet Alexander Pushkin, but asked about another poet, his friend Itzik Feffer. The officials told him that Feffer was holidaying in the Crimea, but would see him as soon as he got back. There now began a frantic effort with the help of doctors to plump up Feffer, who was emaciated after three years in prison, and make him look more like someone who had just come back from holiday. When the two men met, Feffer indicated that the room was bugged, and that he could not say much, but managed to convey to Robeson something of what was happening to him and others. In his concert at Tchaikovsky Hall on June 14, 1949, which was broadcast around the country, Robeson asked the audience for silence, and spoke in tribute to his friends Feffer and Shlomo Mikhoels. He then began to sing, in Yiddish, the Vilna partisan song - Zag nit keynmol, az du geyst dem letstn veg, - Never Say That You Are Going on the Last Way. Alas, back in the 'States, confronted by reporters asking questions about antisemitism in the Soviet Union, Robeson reluctant to concede anything which might be used for the Cold War, denied having seen anything of it. The US government launched its anti-communist witch hunt and took away Robeson's passport. Many others, some of whom had probably been at that Anti-Fascist rally in 1943, lost their livelihoods. Feffer and his co-defendents lost their lives, being executed on August 12, 1952 at the Lubyanka prison. They were posthumously rehabilitated in 1955. Paul Robeson's concert, including Zag nit keynmol, is available on record, and I'm reliably assured his Yiddish pronunciation is as good as his singing voice, but unfortunately his spoken words seem to have been lost. Also I notice that You Tube and various websites, including those of folksong publishers, describe the Vilna Partisan Song as the song of the Warsaw ghetto revolt. I suppose it is too much to expect American readers and listeners to remember the names of two east European capitals, and I am not going to raise outdated Litvak-Polak differences! An international event held by Five Leaves and the Jewish Music Institute commemorating 60 years since Stalin executed the cream of Soviet Yiddish writers and others from the Jewish Anti-Fascist Committee. Gennady Estraikh, Associate Professor at NYU will speak on "Why did Stalin murder Yiddish writers? ", and Robert Chandler, translator of Life and Fate will speak about Vasily Grossman and Isaak Babel. Music from the Soviet Jewish world: Polina and Merlin Shepherd. Admission free, light refreshments provided. In the early years of the Russian Revolution previously forbidden literature flourished. Jews in the Soviet Union founded new magazines, publishing houses and literary movements. In the 1920s they produced brilliant avant-garde work, written in Yiddish, which sat alongside the best of European modernism. Later, Yiddish writers had to respond to the twists and turns of Stalin's rule in their struggle to be creative, to make a living and, when the purges started, to survive. Little of this work has been translated into English, despite writers like David Bergelson, Peretz Markish and David Hofshteyn having a large readership among Yiddish speakers internationally. During World War Two the Jewish Anti-Fascist Committee (JAFC) was set up in the Soviet Union, bringing together scientists, writers, actors and other intellectuals. In 1948 the JAFC was closed down and many of its leading activists arrested. After a long period of imprisonment thirteen members of the JAFC were executed on 12 August 1952, including most of the writers represented in the book. From Revolution to Repression includes translations of fiction and poetry, some modernist, some socialist realist, by several of the writers who were executed or died in prison. The book outlines the individual and collective history of the authors and gives an overview of Soviet Yiddish literature. It is published to commemorate the 60th anniversary of the executions. The editor and main translator of From Revolution to Repression was the South African academic Joseph Sherman who taught at the Oxford Centre for Hebrew and Jewish Studies. He died before the book was completed. Gennady Estraikh (New York University) contributes a short memoir of Joseph Sherman.